Grace Lee Boggs lived an inspiring and consequential life. She died on October 5, 2015, at age 100. You can read about her by clicking the link under her name, or by reading her own book, The Next American Revolution, or by reading (or listening to) this tribute by Amy Goodman on Democracy Now. 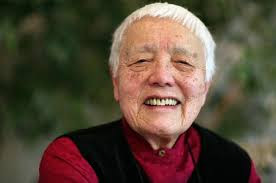 Detroit ... Grace Lee Boggs explained, "is now the symbol of a new kind of society, of people who grow their own food, of people who try and help each other, to how we begin to think, not so much of getting jobs and advancing our own fortunes, but how we depend on each other. 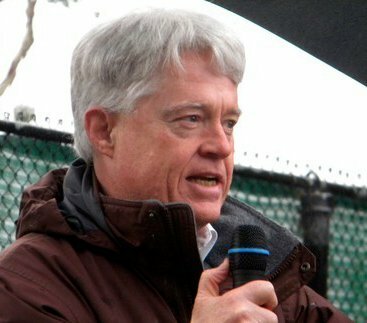 I mean, it's another world that we're creating here ..."
If we hope to create "another world," and it's up to us, we will do it not by "advancing our own fortunes," but by depending on each other. Another world, a world different from the world we have, is the world we need. And it is by acting together, and depending on each other, that we create our human world.